Former Students - Kristin Majda, M.S., M.B.A. It is important to remember those people in our lives who have made a difference. For me, it's my students. I enjoy seeing them grow up, pursue careers, and start families. I find it especially rewarding when they take interest in STEM (science, technology, engineering, and math) careers. I haven't taught full time in a classroom since 2014 but I still remember and cherish all of "my kids." And now I am starting new journeys with littler kids working as a K-5 STEAM Literacy TOSA for a school district in Ventura County! 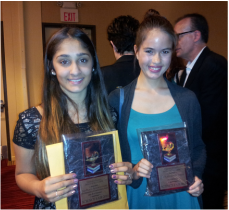 CONGRATULATIONS TO SARAH KAZMIE AND LAUREN HINKLEY! Lauren won 1st place in the Microbiology division of the 2015 Ventura County Science Fair for her excellent research on the effects of vitamins on microtubule depolymerization and their potential impact on patients undergoing cancer chemotherapies that target the mitotic spindle. She also placed at the 2016 county science fair for another excellent project focused on cancer research. Sarah won first place in both the 2015 and 2016 Ventura County Fair Computer Science and Math divisions for her excellent engineering skills developing a software program that allows users to take photos of their skin blemishes using their smart phones and then analyzes them for their likelihood of being cancerous. Sarah also took first place at the 2016 state competition and received a special award in the Math and Computer Science category! I am extremely proud of both of these bright, hard working young women and cannot wait to see where their education and careers lead them! 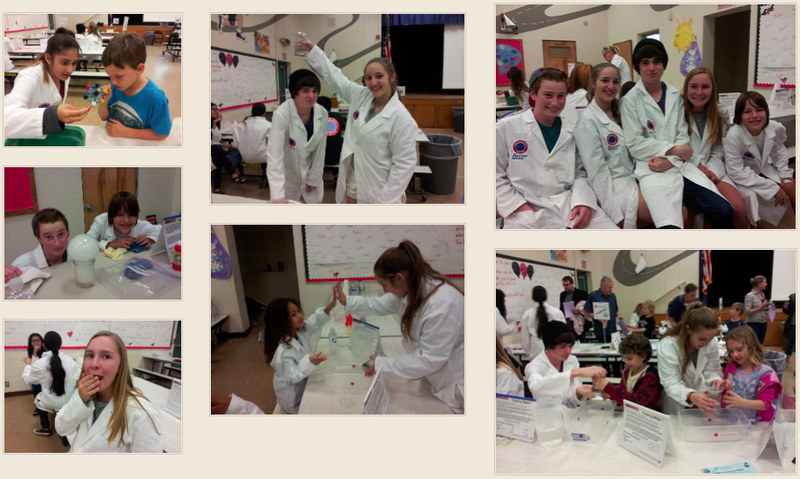 Students Earn Enrichment Credits by Volunteering at Family Science Nights! These students learned that teaching others about science can be a lot of fun! High schools students who volunteered at Family Science Nights, a program of the Discovery Center for Science and Technology, helped elementary students work through various hands-on science activities during a two-hour fun-filled interactive evening at their school site. For many students, volunteering at Family Science Night was one of their favorite parts of my biology course. It is just one of many opportunities that students had to interact with science outside of school, in the "real" world. Casey is currently pursing a Ph.D. in Immunology at U.C. San Francisco and intends to pursue a career as a research scientist. She graduated from UCLA in 2014 with a bachelor of science degree in Microbiology, Immunology, and Molecular Genetics where she worked in a molecular genetics lab at UCLA doing research under Dr. Jeffrey H. Miller investigating triple antibiotic interactions in Escherichia coli. 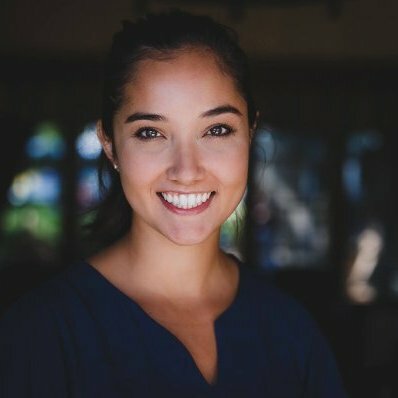 Casey participated in several research opportunities for undergraduate students while attending UCLA, including the CARE Scholars Program, the CARE SEM Summer Research Program, the MSD Scholars Program, and CAMP. Mrs. Majda's biology class taught me that the best way to learn something is to figure out what about it most interests you. If you are actually curious about something then when you read about it or discuss it in class, you're going to pick up a lot more information and, before you know it, you've learned a whole lot. My curiosity from those questions in biology class led me to the research I'm doing today! Mrs. Majda thinks this biology stuff is really, really cool. It might surprise you at first just how excited about it she gets. But if you are able to figure out WHY she thinks a topic is so cool, then that probably means you learned what you were supposed to and you probably won't have to worry about that test she's going to give you because that's what she's going to ask about anyway! 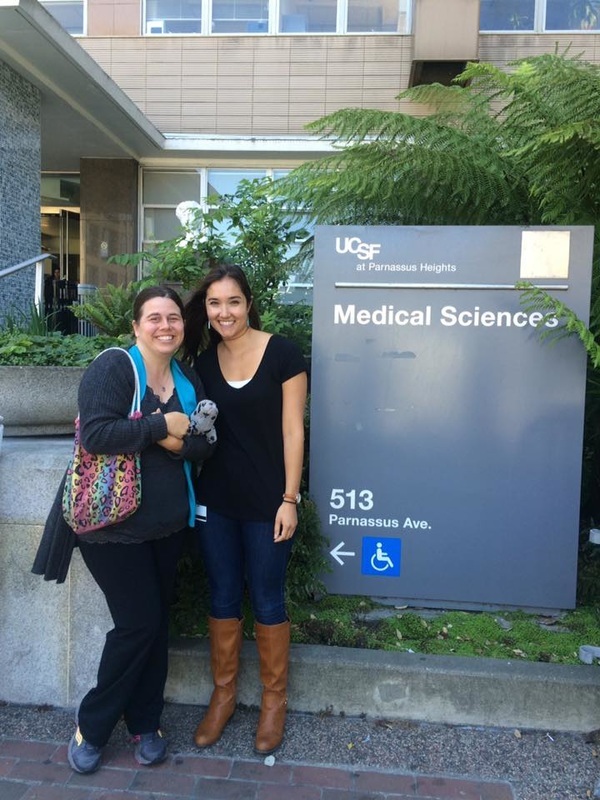 I got a chance to visit Casey in summer of 2016 at her research lab at the UCSF Medical Sciences facility in San Francisco. She took me on a wonderful tour and showed me the super microscope she is using to study how white blood cells communicate with other cells within the human body. I could not have been more proud of the excellent work Casey is doing to help uncover new potential therapies for human illnesses. Steven took Ms. Majda's honor's biology class when he was in 11th grade at Villanova Preparatory School in Ojai, California and graduated from Occidental College in Los Angeles with double majors in Political Science and Economics. Steven's study abroad experiences in college included the London School of Economics and Political Sciences, and the Chinese University of Hong Kong. He also participated in the Summer Institute for General Management Program at Stanford University and worked as a teacher’s assistant at Occidental College, and as a canvassing director in North Philadelphia for the 2012 Obama Campaign. "Mrs. Majda’s class was quite influential for me; she not only trained me with biology knowledge but also with valuable study skills. Although I am not studying the field of biology, I still apply those study skills throughout my various college studies. Moreover, I must say that her biology class is the coolest class I have ever taken, given that I gained insight not merely from a book, but from the hands-on approach and practice of anatomy that Mrs. Majda utilizes in her classes." Hannah completed biology with Ms. Majda during her sophomore year at Villanova Preparatory School in Ojai and is currently attending Montreat College in North Carolina. Hannah is an accomplished athlete who played basketball for two years for Montreat before transitioning over to volleyball. She is double majoring in psychology and human services, participates in the Student Government Association (SGA), and is a Writing Scholar. Regarding Ms. Majda's biology class, Hannah says, "Science was never my favorite subject, however, I really did enjoy dissecting and learning about the human body." "After the first couple days of class, I thought my sophomore year was going to be horrible and I was never going to be able to do well in the class. During high school, I was very involved with ASB as well as playing two varsity sports, thus I was afraid that I wouldn’t have the time to commit to the class. I did struggle at first, and yet things changed. By the end of the year, I not only had the factual knowledge of biology, but I also learned to discipline myself and do efficient work in a limited amount of time. This class taught me how to organize my notes and how to study, which is extremely important as one continues to pursue more education. I highly recommend taking this class because it will help you discover what type of studying works best for you. And I did receive a good grade in the class! I believe what I have learned from Ms. Majda has since then assisted me in doing well in all my other classes." Maddie is in her senior year at Loyola Marymount University studying theater and plans to pursue an acting career. She is considering a career in nursing as well, probably do to all the fun she had in Ms. Majda's 10th grade biology class at Villanova Preparatory School. 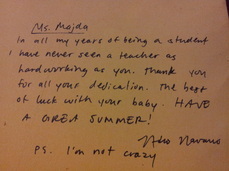 "Ms. Majda was one of the kindest teachers I ever had. 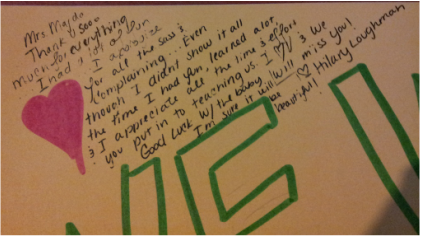 She genuinely cares for her students. I feel pretty lucky that on dissection day, I got the frog. Although I certainly would not say that science is my forte, I have always been interested in the way the human body works. Ms. Majda challenged me, and all of her students, to explore all of the information that is at our fingertips. She is so passionate about what she teaches, which is a good thing, because getting a group of fifteen year olds excited about nuclei and lipids can be difficult, especially at 8:00 a.m.!" "Levina, I think you should move into Honors Bio," I was surprised to hear this from Mrs. Majda, considering I never thought about Biology as more than a subject before sophomore year. After moving from a normal Bio class to honors, I learned quite a few things in the process. First, hard work really does pay off. Bio seems like a lot of busy work, but it subtly trains you for life. Secondly, pay attention in class! The little facts you learn in high school make a difference later in life. Lastly, if you're interested in biology, or any subject really, it helps to go deeper. Take that extra step. Research on your own. Learn and explore the world around you! Follow your interests! It can only lead you to good things. Even though I did not take the Bio route in college, Ms. Majda's class helped me realize my true passion for science. I am currently a senior at Santa Clara University studying Computer Science and Web Design Engineering. I plan to integrate my love for teaching and people with engineering when I graduate. Click here if you are a former student and would like to be included on this page.